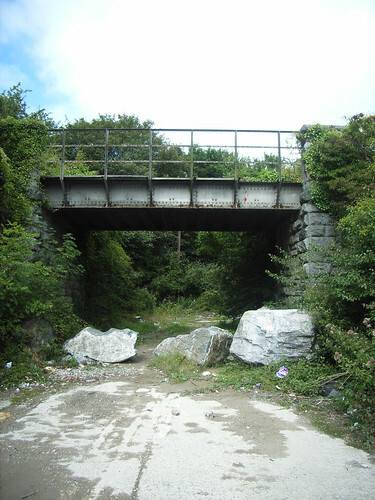 Just up the road from the CDS bridge is this simple metal railway bridge which used to carry the branch line over this lane which I believe leads to some of the quarry workings. Obviously the lane is no longer in use. This is just past the site where the Turnchapel branch leave the line and heads across what used to be Stamps Bridge, but has now been demolished to make way for a roundabout. There is a small reminder of that bridge which will be covered shortly. I've always found these sort of old disused spots so atmospheric. I don't know why, perhaps it's some form of nostalgia or the wonder of some sort of connection with a time past.